I am originally from South Africa haling from the sun kissed beach city of Durban (otherwise known as the "Last Outpost of the British Empire"). 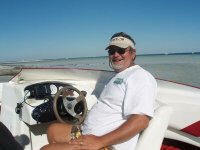 I have also lived in Namibia, and traveled to Britain, Europe, USA, South America and Asia several times. 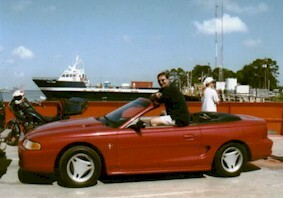 In 1997 I moved to the United States. Why? Well, a woman of course, why else would one move 15,000 miles to a new home away from one's friends and family, to a "foreign" culture? 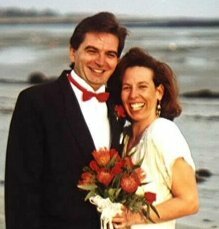 On March 28, 1998 Wendy and I were married on Goose Rocks Beach, Kennebunkport, Maine. Since then we have lived in Kennebunk - Maine, San Francisco and Los Angeles in California, Phoenix - Arizona, Dallas - Texas (yeah, I know, so I move around a lot) and now finally in the "small city on the river" Port Richey, Florida where we have settled for good. Florida is, of course, the great melting pot of Commonwealth / American culture as no one from Florida is actually from here! other North East states, believe it or not, are from Britain. There are more English expatriates per square mile in Western Florida than there are anywhere else in the world. A great place to research American / English culture. All this aside, I have settled into American life quite comfortably - I LOVE my Ford Mustang convertible (I don't even want to begin to think what this baby cost in South Africa!!) and God forbid, I have even begun to think in American (hence this website being spelt in American English!!). Hell, just the other day my wife caught me saying that I was " fixin' " to go to somewhere! I am content in my house on the water in New Port Richey, Florida where I work from home as an independant web designer: www.longmancomputers.com and help my wife run our other company Windsong Sailing Charters. But more than all, my most precious possession is my American wife Wendy!